Out of all the four documentaries in this series, I knew this one would be the most popular. In this series, this place called Hispaniola or Quisqueya is the only place that two cultures are compared in such a way. Black in Latin America: Haiti and the Dominican Republic is billed as the story of one culture in denial and the other in love with its independence. I was so excited about this workshop, which was last Saturday, that I invited a very special guest, Dr. Silvio Torres-Saillant. He is the intellectual that appears in the 13th minute of the episode. Dr. Torres-Saillant is a professor at Syracuse University that always amazes me with his intellect. The other person with this particular subject was fellow blogger and SU Alum, Jose Vilson who lives in both worlds being Haitian and Dominican. I figured I had my bases covered. Little did I know that Dr. Torres-Saillant was about to bring it. Hispaniola was the first place to import African as Slaves. Dominicans are proud to a mixed raced society and Haitians are proud to be black. Santo Domingo was founded in 1496 by Bartholomew Columbus. Most Dominicans consider themselves Inido. Sambos represent what being black means. One of the first sugar plantations was in the Americas was in Nagua. Cattle Ranching plantation worked differently than other plantations due to the nature of the work. The master/slave dynamic was different. There was almost an equal footing. The collapse of the Sugar Industry lead many whites to leave Santo Domingo. This left people of color to basically fend for themselves. They maintained loyalty to Spain. There are some musical customs that contain African Roots and have been around for 500 years. The Haitian government had a profound effect on the Dominicans such as trying to change the language from Spanish to French and making changes to religious practices. Dominicans reject everything that was considered Haitian, including, in many ways, their skin color. Dominican elite tended to “whitetify” historical figures if they were too black. Years later, Haitians become migrant workers who did jobs that Dominicans would not do. This gave many Dominicans the notion that they were in a higher class than the Haitians. The imported tens of thousands of Haitians. Blackness became a Haitian trait and a negative term in the D.R. Rafael Leonidas Trujillo was a dictator who did more to harm relations between the people on the island than any propaganda or slanted education did. He declared Santo Domingo to be a white nation and hid his own dark features. At this point the documentary begins to focus on the Massacre River and how over 15 thousand Haitians were slaughtered there. So to expand on this point I simply looked it up. Dr. Gates mention this happening in October of 1937, which is true, but the event itself was across the island and lasted a week. Before I continue, I need to mention that we did watch the entire episode. Due to time constraints and the point I want to make here I wont go into the Haitian side of the story because quite frankly, it was not discussed largely because we talk more about the racial views of the Dominican Republic. Of course I talk about being amazed by this episode and how it shows racial views as how we know it. Jose Vilson comments about his own struggle of racial identity before being comfortable with the term Afro Latino. However, it was Dr. Torres-Saillant that made everyone in the room what to read more about the extraordinary rich and noble history of Santo Domingo. Now where in the documentary does it state about the numerous rebellions of the Dominicans Slaves. 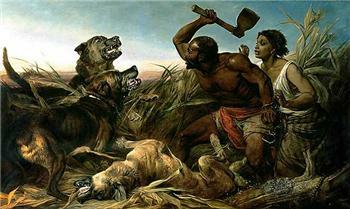 He begin to explain about the first major slave revolt in the Americas occurred in Santo Domingo during 1522. He talked about how many of the slaves managed to escape to the mountains where they formed independent maroon communities. This was something that I did not know. I was floored by this. Dr. Torres-Saillant said he mentioned this to Dr. Gates, but this was not included in the episode. It comes down to this, and this is a summarization, it is not whether or not Dominicans say they are black or not. They know that come from Africa. It is in the culture. It is in the religion. It is in the music. There is a part about about voodoo being practiced in Haiti, but many of those same things are also practiced by Dominicans in very similar ways like we saw in Cuba. Dr. Torres-Saillant points out that he is not interested in what people say but rather he is interested in what people do. Dominicans do black things. However, it is a type of “black” they are rejecting. They are rejecting the negative types of black that has been instilled in them. When I had a chance to talk to Dr. Torres-Saillant afterward, I mentioned to him that although I am not Dominican, it seems that my family rejects this notion of blackness too. I told him how my grandmother once told me I should not date a black woman. He is response was eerily similar to my fathers. He said to me that it is not an issue of weather your family is racist, it is more the fact that image of blacks in this country is so bad, she doesn’t view you in the negative way that black people are being portrayed. He then gets technical and says that in reality we are all the same. Skin color is based on the human body’s need to adapt to different conditions around the world. Culture is what people really fight about but they connect culture with skin color in America. Black is not viewed in the Dominican Republic or even in the Caribbean the same way it is viewed in the United States. It is only when you are forced to identify yourself do you reject or accept the choice given to you. That made me realize something else, this episode never talks about American influence in Santo Domingo. Trujillo was an American backed dictator… again, very similar story to Cuba. Yes, Haiti was the first black independent commonwealth in the Americas and it is very inspiring to many black people, but this idea that Dominicans just accepted the assimilation of the European ways is completely false. More importantly, the 22 year rule of Santo Domingo by Haiti give many Dominicans this notions that the two people were completely different. In realty, two sides of the same country split in half by two different ruling countries sparked divides that exist today. Great post! I observed this when I lived in DR. It's kind of crazy when there's about 10 official ways to describe people of color (indio, indio-oscuro etc.) I would always take a look at that part of people's I.D.s. I also have had similar experiences with family suggesting to not marry or have any children with women of color because that will be a sort of handy-cap in life. I spent time in Haiti and the Dominican Republic for a bit. I'm Haitian American and my skin tone is fairly “light” I guess you can say. As soon as I spoke creole or let it known I was Haitian while in the Dominican Republic, I experienced a lot of discrimination. It left me with a feeling that I can't fully describe, even now, after all of these years. I look forward to watching the documentary. Next Next post: Latino Student Apathy or Entitlement?